ECONOMIC AND FINANCE REPORT – Page 2 – Reporting International Business, Economy, Real Estate, Entrepreneurship, Investing and Financials Globally, "Show The Light And The People Shall Follow, To Find The Way" "The Will Of The People"
Don’t just stand on the side lines watching, here’s you place to post your thoughts and opinions to share with others. The blue text tells you all. Don’t just think it- write it! share your opinions and thoughts with the world. 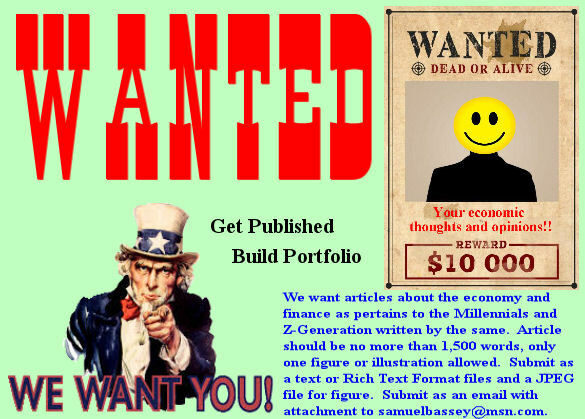 Write short articles about the economic and financial world of young Americans and have them posted here where others can read them.